I am a beginner in music with little knowledge, but like once in a month spend a little time playing with a digital keyboard. I noticed that if I have some notes of a song which got 4# in the beginning of the stave, I can play the song like there is 3♭ instead. The same happens if I have 4 bemols (flats) then I can play the song like it has 3 diesis (sharps) (yes, it will sound a bit higher, but not that different). I was curious if other combinations exists, let's say we have a song in 2 bemols (flats), what is the equivalence of it in diesis (sharps)? I couldn't find it myself. Is there a name for this phenomenon so I can learn more? I'm not aware of a name for this phenomenon, it's just a quick way to transpose music based on how the tonal system works out. In short, when you're in a key, look at the key signature. Take the number of accidentals in the key and replace them with the mod-7 complement of the other accidental type and you're left with a key built a half step away from the original tonic. So you're in E major with 4 sharps. Let's take the mod-7 complement of the other accidental type: 7-4=3, so we're left with 3 flats, which is E&flat; major, one half step away from the original tonic of E.
You're now asking about 2 flats in the key signature; this is B&flat; major. 7-2=5, so a key of 5 sharps will be B major. This trick is especially fun in C, which has 0 sharps or flats. The mod-7 complement of 0 is 7, so if we have 7 sharps in the key signature, we're in C&sharp; major; 7 flats makes it C&flat; major! Note that this trick isn't exclusive to major; it works for minor keys as well. Lastly, know that this works perfectly until you encounter accidentals in the music; you'll have to have a more contextual understanding of those accidentals to know how they should be interpreted in your new key. This is a consequence of the key signatures. Basically, what you're doing is changing the number of accidentals in the key signature by seven (some would argue that's an oxymoron, but you all know what I mean). It turns out that by doing this, you've transposed the song into the key a half-step up. If you want the same exact key, you can add or subtract 12, but that makes for some ugly key signatures. It's pretty intuitive; change the number of accidentals by seven, and you lower or raise every note by a half-step. That's the definition of how to transpose by a half-step! When you describe this kind of key relationship, I just "get it," because I know the key signatures well enough. But I really wanted to know why or how this relationship exists. Below is a chart I drew showing the circle of fifths (and circle of fourths) but arranged as a line. I'm not sure this will help you, but it shows the key 'symmetries' with keys paired up according to the funny modulus math @Richard describes in his answer. The middle number row 0-11 is both the position on the circle of fifths/fourths and the number of sharps or flats in the key signature. When you go past the two dashed line boundaries - beyond the area I labelled the _7 letter gamut - you get into the weird enharmonically complex keys. You can get the modulus math to work in this region by adding a _negative number (bottom row) which represents going backwards on the circle of fifths. Ex. E#/F at position 11 and Fb/E at position -4, 11 + -4 = 7. 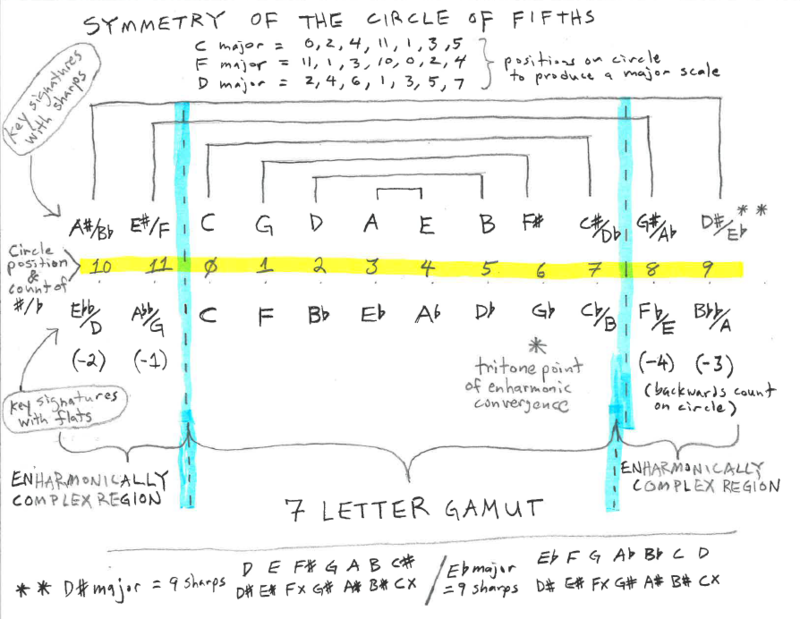 At the bottom of the chart is a sort of test that the numbering in the enharmonically complex area outside the gamut is true. As bizarre as it is to say 'Eb major is 9 sharps' is mathematically true. Finally, the is a kind of geometric symmetry of scale for each position along the circle. Any major key in the sharp keys shares mirror symmetry with the corresponding flat key's fifth mode of the relative minor. It's easier to explain by example: at position 3 A major A to A ascending shares a mirror symmetry with C minor (Eb's relative minor) G to G descending. You can test that on the keyboard as see how the two scales are inversions sharing the same sequence of whole and half steps and the same sequence of white and black keys. 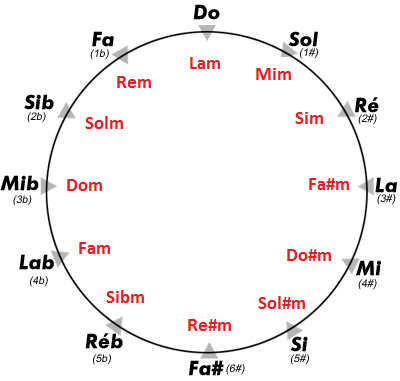 There isn't a specific musical term for all this, but when you write out the circle of fifths as a circle of counting line or compare the inversions of scales you have a kind of mathematical symmetry. Do, Re-bemol, Re, Mi-bemol, Mi, Fa, Fa#/Sol-bemol, Sol, La-bemol, La, Si-bemol, Si.